If you haven't already guessed, I love the NFL draft, it is by far the single most entertaining day of professional sports that doesn't include an actual contest. 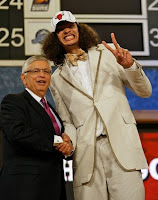 While the NBA draft does showcase how abnormally tall men fit into obnoxiously ugly suits (see Joakim Noah in 2007) and provides my friends and I with several hours of drunk banter, the NFL draft is still the most intriguing. The 2008 NFL draft certainly will follow in past years footsteps with plenty of questions unanswered thus far. Question #1 With Darren McFadden performing as he did at the NFL combine last week in Indianapolis, is he the consensus top player in the draft? I believe that Darren McFadden is and has been the best football player in the 2008 class since the beginning of his fall campaign. It should also not come to your surprise that he blew away the competition at the combine, McFadden is bigger, stronger, and faster than any other running back coming out. A Heisman Memorial Trophy finalist each of the last two years his talent is obviously not a secret, his only fault is the position he plays, running back. Selections 1 through 5 don't have an immediate need in the backfield, while McFadden would certainly booster their respective offenses, they all clearly have more gaping holes. Falcons fans ask yourself this question: After Mike Vick, Do you really want a guy who has ANY questions surrounding his character? Exactly. Question #2 While we are on the topic, Is Jerry Jones crazy enough to trade up to the top of the draft in order to select McFadden? Here is how I justify giving up Marion Barber: If your going to go for it all and put all your chips in the basket of Darren McFadden this is why you would do it; Rushers like Barber, power rushers, who punish defenses cannot sustain success at such a high level, the toll it puts on their body is intense. Few rushers have been able to have long careers being that type of rusher, Jim Brown, Jerome Bettis, and Earl Campbell to name a few. Assuming that Julius Jones leaves in free agency, Barber becomes the feature back next year, which means more carries and more banging, you've got to ask yourself that question, how much longer can he sustain his rushing style? This offense, which is tailor made for a quality rushing attack, may in fact be the BEST situation for McFadden to succeed. Mr. Jones cannot sit on these two first round picks with the possibility out there, so when I say: YOU BET YOUR A** it means that if the offer is still on the table come April, Jerry pulls the trigger. Oh yea, a 4.33 in the 40 at the combine doesn't exactly deter Jones. Question #3 How has Glenn Dorsey gone from the top pick to some saying he could take a Quinn like slide all the way toward the bottom half of the top ten? Don't get me wrong I think Glenn Dorsey could potentially be a clone of Warren Sapp in 10 years when we look back on his career, but he does have a rather HUGE question mark rumour lurking. Dorsey said it best "I haven't missed a game in four years" and playing hurt does worsen injuries right? A top 5 pick demands major dollars, major committed dollars for an organization to risk on a defensive lineman who could POTENTIALLY have problems shortly down the road. He doesn't fit Parcells defense and I thought that his talent and athletic nature could overcome that, not now. Today with rumours surrounding his health, he has all but been ruled out of the Dolphins selection. Secondly, the play of Sedrick Ellis at the Senior Bowl and his 6'1, 305lb. frame being impressive to scouts at the combine, he has moved into comparisons with Dorsey, not as talented, yet just as dominating. Dorsey could be bound for Oakland if you ask me at #4, that is if Jerry has leapfrogged everyone and grabbed McFadden away from the grips of Al Davis. Question #4 Is Matt Ryan just the top quarterback in the class, or is Matt Ryan a franchise leading quarterback? 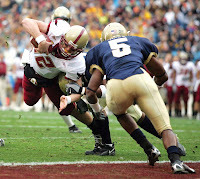 I don't care if you call this Boston College Football season ticket holder a homer or not, Matt Ryan is the real deal and we need to show a little more respect where its due. Pick up this weeks' edition of SI and read what scouts have to say about Ryan after last weeks NFL combine, the same combine which he impressed people without even throwing the ball. It is no secret to my readers that I am a BIG fan of Ryan's game, he has all the tools of top NFL quarterbacks, he can move, he has a short memory in regards to not being afraid to take your shots downfield after an early interception, and he more imporantly has size. 45 starts at Boston College has given scouts PLENTY to look at and I'm sure they have documented each of his 19 interceptions from last season and still consider him tops on the board. I admit I may be a little bias when it comes to Ryan but he is a franchise quarterback in my mind. Although he would never admit it, I'm more than positive he does not want to land in Atlanta, and why would you? The best situation for Ryan would be in Baltimore, where there is a running game, established defense, and a new head coach with experience in coaching up quarterbacks. For quarterbacks, especially top draft pick quarterbacks to succeed in the NFL it is more the situation they are put in than the skill set they have. Palmer, Rivers, Roethlisberger, and Romo are young successful quarterbacks, attain that to the teams and players that they are playing around along with their talent. The cast of characters that would surround Ryan in Atlanta would be dreadful, not exactly a place he would like to break into the NFL in. Alex Smith was the "best quarterback in his class" Matt Ryan however is THAT franchise quarterback, Manningesque even as his agent says. Question #5 Who will Bill Parcells and Jeff Ireland select at number one? 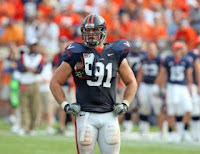 With the #1 pick in the 2008 NFL Draft, the Miami Dolphins select, Chris Long, defensive end, University of Virginia. The NFL is a copy cat league right? Two years ago the Houston Texans were faced with similiar problems, a lock defensive end, a remarkable rusher, and a excellent quarterback prospect, who did they take? Mario Williams, who many assume today, that he will have the most longevity in the league. Chris Long is built for Bill Parcells and a Bill Parcells lead organization. Jeff Ireland is about to make the most important selection in the teams recent history and it cannot be one that is spent on risk. Long has familiarity with the Parcells style, under Virginia head coach Al Groh, a Parcells disciple, he had 14 sacks this past college football season. I've read so many articles and mock drafts that have Long as the #1 overall, he demonstrates the new beliefs of the head coach, gm, and executives, all signs pointing toward Chris Long, barring any injury questions, will be collecting a giant pay check every sunday as the #1 selection. I agree with you about Barber, especially when you mention Jim Brown and Earl Campbell as guys who had long careers are punishing backs. Brown had 9 seasons, Campbell had 7 and two of those seasons sucked. You've already got 3 years out of Barber so what can you expect? 2 more quality seasons, maybe three if you're incredibly lucky. Why not take the rookie, use him up on his rookie deal and then move on from there.